1-2 years old? 2-3 years old? 1-2 years old? These are 3 of 5 babies that were confiscated from a backyard breeder. The other two are in safe homes. It took 7 hours and three people to painstakingly remove mats, that were embedded so deep, twisted into their skin, caked with urine and feces. Fleas were crawling in masses on them. My friend and groomer finally had to put on a glove, as her hand was burning from the urine on their fur, can you imagine how their skin had felt. My breath held in, many times, as I was told there was no way to get these mats out of them, and they may get cut, there was no option, they had to be removed. And again someone looked over our shoulder, as not one nick or cut did they receive. In their entire lives I do not believe they had ever been groomed, they had to have lived in a cage, bathed in their own excrements ..I know that charges have been laid against the person who put them through this H**L, and whatever is the outcome, it will not be enough. Faith and Destiny (nka Ellie, who was named in my honor) are living with a spectacular couple, who just could not decide on the two girls, and realized what a wonder to have them both...happily residing in Woodinville, Washington. My best friend, Mitzi, got her wings at 9:37AM on January 18th, 2013. She was tattooed on her belly by the puppy mill, and the best that I could tell is her birthday was 08-26-01. That made her almost 11 years and 5 months old, longer than I expected, but not nearly as long as I needed her here with me. Mitzi started her life in a puppy mill, was sold at a pet store, turned into Furbaby Rescue then adopted by me at around three months old. She had been passed around way too much in her short life, so became very attached to me, her “sister” Sophie and her home. Mitzi was a force to recon with. She was a fierce protector of our home and everyone in it. She had a zest for life that I envied and admired. You see, this little dog was not genetically gifted. Her health began to take a turn at around 7 years old. 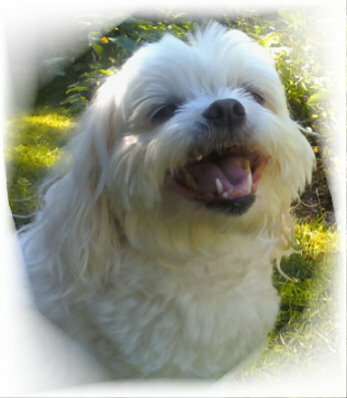 She had arthritis and liver disease that we fought with everything available until the very end. But Mitzi was so much more than a frail little dog, ant that’s not what I want to talk about. I want to talk about how brave this little girl was, and how she fought to keep going in spite of her physical problems. This little dog had more heart than a dog 10 times her size. She loved me as much as I loved her, and I told her every day how much I loved her. I am angry that a puppy mill caused this little dog’s suffering which she tolerated with such grace. I will miss her until the day I die, and thank her for coming to live with us and being such a good teacher. We learned patience and perseverance, but mostly we learned grace and unconditional love.